On Thanksgiving, Stores Serve Up A Side Of Shopping Black Friday is seeping into Thanksgiving Day, a new trend dubbed "Gray Thursday." Brick-and-mortar stores have been competing with online retailers that have been scooping up early holiday shoppers. But it's unclear whether the extra effort it takes to open on Thanksgiving is worth it. 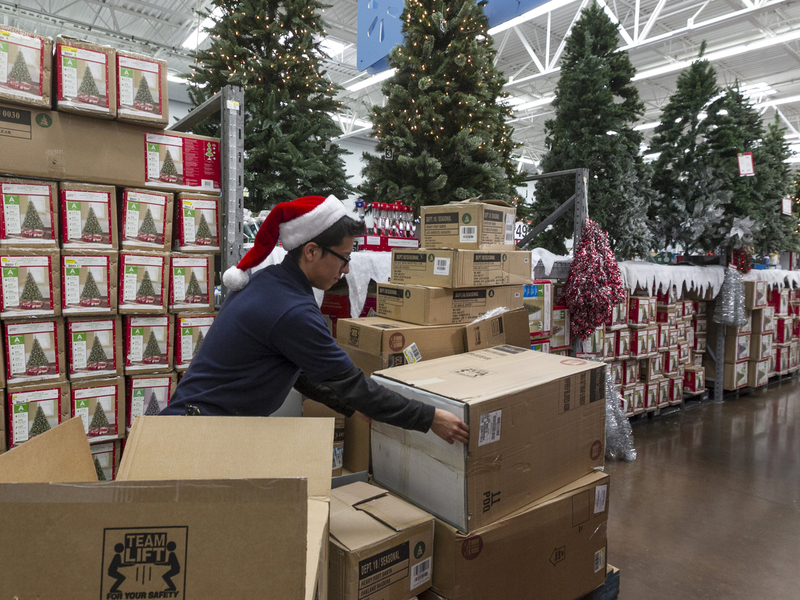 Walmart associate Angel Campos stocks Christmas decorations Wednesday ahead of the pre-Black Friday event at the Wal-Mart Supercenter store in Rosemead, Calif.
Gray Thursday may become the new Black Friday. Many big retailers have moved up the beginning of their shopping season, traditionally the Friday after Thanksgiving, to Thursday evening. Brick-and-mortar retailers are feeling pressure from online retailers, which have given consumers an earlier shopping option. "In the past, online retailers have had Thanksgiving Day all to themselves," says Marshal Cohen, retail analyst with the NPD Group. "And what that means is by the time Black Friday comes around, a lot of consumers have already spent a bunch of money." But whether opening on Thanksgiving is worth the effort will depend on the customers' response. Online spending has increased fivefold in the past decade. Cohen says it's that online spending that brought about the Black Friday deals in the first place. He says as online shopping grows, traditional retailers are trying to build excitement and get the dollars as soon as they can. "When the wallet is at its fullest, consumers are less likely to look for deeper discounts — and more likely to spend on themselves," Cohen says. "So that early dollar is the most coveted dollar." The battle for those dollars will begin even before the pie is served. There's been a backlash against the early hype. Virginia Edwards, from the suburbs of Denver, says she'll shop Friday but not Thursday. "I'm spending it with my family. ... It's Thanksgiving, I have a whole bunch of people coming over, and I plan to do that on Thursday," she says. Edwards says she likes to go shopping after the holiday. Besides, she says, she's already gotten most of her shopping done and plenty of good deals. "I buy a lot of my stuff online just because I don't have to pay tax, and they've had really good specials the last two weeks," she says. "So I just have a few more gifts to get and I'm done — I just shop for stocking stuffers." Julie Seewald will work at a department store with the crowds late Thursday. "I'd rather not, if I could choose, but everyone who does that just kind of has to buckle down," she says, "and it's part of retail." But not all retailers are getting into the game. Nordstrom has put up signs explaining that it won't be open on Thanksgiving. "The signs say that we celebrate one holiday at a time, and that we are unveiling our holiday decorations the day after Thanksgiving in all of our stores nationwide," says Brooke White, vice president of communications at Nordstrom. She says customers appreciate that Nordstrom gives each holiday its "time." Meanwhile, Cohen, the retail analyst, says there is a great risk of consumers getting burned out on the holiday season. Cohen says Gray Thursday is a bit of a gamble. "We all think that retailers have really thought this thing through, but they're trying this," he says. "If the consumer doesn't respond, and retailers don't have a big, strong day and it isn't worth their time and energy ... then they won't do it next year." Cohen says consumers have rebelled against retailers before. But he says if the bargain hunters and those who want a getaway from their families unite, Gray Thursday could be with us for a while.